Scandinavians are ruling the skies when it comes to budget transatlantic flights. 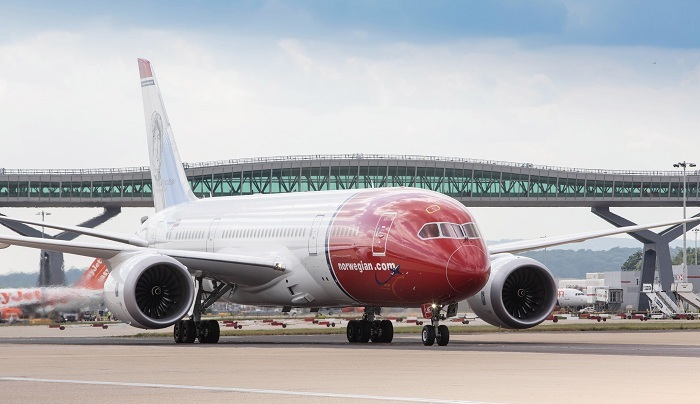 Norwegian Airlines recently introduced their first non-stop flight between London Gatwick and Las Vegas McCarren, at the affordable price of just £179 each way. The route is Norwegian’s eighth direct flight to the USA, and provides a comfortable, cost-efficient alternative to mainline air travel. Taking the trip in November, I settle into my spacious reclining seat for ten hours of snoozing, television and eating. Consisting of two cabins - with both economy and premium on offer - the brand new fleet of 787 Dreamliners are Boeing’s most fuel efficient planes to date, allowing Norwegian to keep their prices low and pollution down to a minimum. Economy seats have an extended 31 to 32 inches of legroom, making for a more comfortable journey than often found on budget flights. The in-flight entertainment system has a small but satisfactory selection of films, TV programmes and games and I’m able to while away the hours tracking our progress across the globe with satellite images of the ground below. When dinner is served I consider that king prawns are perhaps an unusual choice for an in-flight menu, but they are flavoursome, light and a welcome alternative to the often bland and stodgy food found when flying. Snacks can be purchased throughout the flight from the interactive menu; just swipe your credit card to open a tab or pay immediately for your purchase – it’s the most hassle-free in-flight shopping I’ve ever had. At the front end, premium class offers 46 inches of legroom and deep reclining seats. The seats in front are so far away the entertainment system has to be withdrawn from the ample armrest or you wouldn’t be able to see it. At £499 each way (including taxes), the price allows you access to the No1 Lounge at Gatwick and offers priority boarding, making for luxurious travel at a bargain price. Attentive, well turned-out cabin crew serve meals and refreshments throughout the ten-hour flight; it’s easy to forget you’re actually traveling on a low-cost airline. But it’s Norwegian’s new fleet of 787 Dreamliner aircraft that steal the show; I barely notice take-off and landing, it’s such a smooth experience. The jet-lag reducing cabin-lighting is orchestrated to fit the routine on-board so I’m refreshed and ready to take on Vegas as soon as we land. Large windows can be shaded to make the most of views but reduce startling sunlight glare at the touch of a button and the plane’s cabin is pressurised so well my ears don’t ‘pop’. Throughout winter, four flights a week will depart from London Gatwick on Monday’s and Thursdays, making a long weekend getaway to the bright lights of Vegas a tempting option. Find out more here or join Eleanor on her trip to Las Vegas here.